Home:Blog, Termite Inspection, Termites:Termite Damage vs. Wood Rot: What’s Eating Your Business? 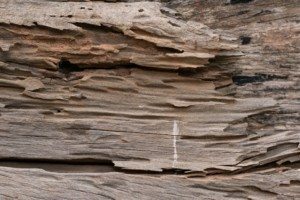 The common type of wood rot you may encounter and what is often confused with termite damage is dry rot. Dry rot is caused by fungi that attack wood and destroys its interior structure, hollowing it out from the inside. Despite its name, dry rot requires moisture to start decaying – and fungi will carry water to the interior of wooden structures. Subterranean termites are the most commonly found termite species throughout Texas. These pests live in colonies under the soil and feed on the cellulose material that is found in plant cells as well as wood. Like fungi, they eat away the inside of the wood, making it hollow and weak. Cracks in foundation and walls allow termites access to wood, where they chew tunnels inside existing structures. Decaying wood due to wood rot is often spongy and stringy in texture and breaks off into rigid, cube-like patterns. Pieces of the wood that are not decayed break off in long slivers. 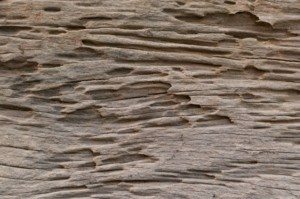 On the flipside, termite damaged wood may appear normal on the outside but has chewed-through tunnels and galleries on the inside. If you guessed that the termite damaged wood is on the left and wood rot is the right, you guessed correctly! In either case, it can be hard to know you have a problem before it’s too late and the damage is done. Both types of damage can cost your business a significant amount of money in repairs. Termite damage, though, costs businesses and homeowners roughly $5 billion in repairs annually across the United States. A pest professional can help you confirm if termites are present, and will help you take the next steps to resolving any issues. Many times, both problems are present, as termites are even more attracted to wood that is already softened by decay and moisture. Experience: Years of experience inspecting and treating commercial structures for termites – we know how commercial facilities work and will get our job done with minimal disruption to our clients. Innovation: Using the latest, most progressive and innovative termite management technology and treatment techniques. Reliability: Holder’s highly-trained and experienced technicians and inspectors know termites and how to eliminate them. Don’t let your business suffer the consequence of termites. Contact us today for more information. You can also download our e-book, The Impact of Termites on Commercial Facilities, here.